B & W photograph of the Rev. David Mills, his wife Wendy and their two children Lindy and Joe, taken outdoors. Rev David Mills was ordained in 1982, minister at Beeac-Cressey-Rokewood 1983 - 1984, Principal of Tupou College Tonga 1985 - 1990, Bendigo East 1990 - 1997, Brunswick from 1998. Blue foolscap plastic loose leaf folder with MOK emblem [transfer/decal as per MOK217] and text on the front. The folder contains blank, lined foolscap paper held in place with a metal fastner. Incomplete MOK Principal Court Shield - purple velvet shield with gold metallic "3 chain" braid) with gold cotton collar. The shield has a fabric and bead Star of Youth symbol. The upper right quadrant has a metal Councillor's symbol "C" and the Past Knight Commander symbol of a crown. Six MOK transfers/decals Dark blue and pale blue and yellow MOK symbol with blue text. Instructions for application on the back. Wooden MOK Degree of Service Mark on metal and wood stand and with wooden cover. The symbol has a green card inside. Gilt and enamelled MOK tie pin. 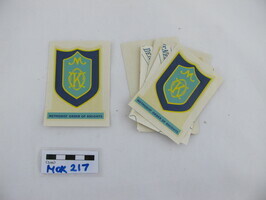 The shield shaped MOK symbol is dark and light blue enamel. The tie pin was part of the MOK dress uniform and was worn in the middle of the plain dark blue tie. Yellow District Court Shield with Blue Collar and Page of the Entrance Symbol. Blue felt banner with gold and blue screen printing of MOK symbol. The banner is on a rod and has gold fringing. General Court shield and collar of purple velvet. It has a metallic fringing and braid. The edges of the collar are braided and it has a Degree of Service red Colour Bar, a 25 year Service badge and a name badge. The centre of the shield has the General Court office bearer symbols: The Gold Star of Youth; the Silver Maltese Cross, the General Court Symbol and the Past Commander's symbol of a Crown. The Commander symbol is crossed gavels above a crown. These are symbolic of authority. Red triangular pennant with gold screen printing. 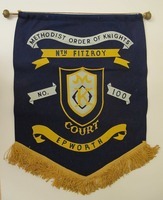 "METHODIST ORDER OF KNIGHTS WINNER. NORTH WEST DIST. 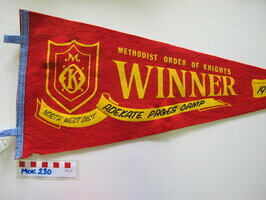 ADEKATE PAGES CAMP 1976"
Blue cotton handmade table cloth with an appliqued and embroidered Methodist Order of Knights symbol. The table cloth has gold fringing. Blue felt triangular pennant with gold screen printing. 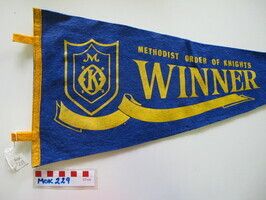 "METHODIST ORDER OF KNIGHTS WINNER"
Blue felt banner with gold and blue screen printing. The banner is on a rod and has gold fringing at its base. Dark brown leather single small saddlebag. The bag is secured with two buckles. This small saddle bag was carried on the off-side (right hand side) of the saddle. Nyah West is a town in Victoria, near the Murray River. It is near the Murray Valley Highway, 371 kilometres north-west of Melbourne and 27 kilometres north-west of Swan Hill. G057.1 and G057.2 - chrome plated souvenir tea spoons with enamelled disc. The tea spoons are in plastic wallets. "Unting Church 1990 Centenary 1890 Invermay"
Brown leather wallet for Methodist Member Ticket with gilt embossed lettering. Varnished wood mallet with silver shield shaped plaque. "METHODIST CENTENARY CHURCH SURREY HILLS, VIC. FOUNDATION STONE LAID MARCH 1915"
Wooden block with metal plate on one side and photographic image on the other. The image is of the Brooklyn Church, 9 Paringa Road, Altona North.